A baby high chair is very convenient way for babies to feed without creating a mess all over the floor of the house. They also provide a hands free way for parents to feed the baby easily and conveniently. If you’re a new parent with a small baby and you’re searching for a great high chair for your baby’s feeding needs, then this guide on the best high chairs 2019 will be of great help in making sure your selection and buying process is easy and confusion free. If you don’t know the exact features to look for in a baby high chair, we highly advise you to read our detailed buying guide just below the reviews to ensure you’re on the right track as far as choosing and buying a high chair for your baby is concerned. This will help you pick a suitable high chair for feeding, traveling and any other needs you may have. But first, let’s take a look at these 9 best high chairs in 2019 and find out why they are our top picks, shall we? Imagine a high chair so versatile and multi-functional that it can be used for two children at the same time. The Graco Blossom 6-in-1 Convertible High Chair is a complete child seating system, with several options for seating one child as they grow over time, and even two different children at once, so it can grow along with your family. The Graco Blossom 6-in-1 Convertible High Chair is adjustable for every stage of your child’s growth, from a reclining infant high chair, to a traditional baby high chair, to an infant booster, a toddler booster, and a child’s chair. It has 6 height adjustments, 3 recline settings, and a removable seat back insert to fit children of any size. The removable tray is dishwasher safe and can be removed with one hand, making it easy to keep it clean, and the fabric covers easily wipe clean as well. The innovative modular seating system of the Graco Blossom means that you can use the youth and booster seats and the infant or high chair seating at the same time, making it a perfect long-term investment, with years of use out of a single high chair system. As one child outgrows the infant and toddler seating, they can transition to the booster and youth seats, while a smaller child can begin to use the infant seating settings. The Graco Blossom 6-in-1 Convertible High Chair seating system is a versatile, useful high chair system that can seat a single child through every stage of development up to 60 lbs., or be used to seat two children at once. That longevity and versatility makes it a great long-term investment. The Graco Blossom 6-in-1 is truly the best option for a single high chair to see a child all the way from infancy to sitting like an adult at the table; it has the most rugged design, versatility and adjustability for every size of child. However, if you are looking for a similar convertible high chair with a slightly more affordable price, the Ingenuity Smart Clean Trio Elite 3-in-1 is a good option. While it doesn’t have as many adjustment options as the Graco Blossom, and can’t accommodate the smallest infants or children over 50 lbs., it does have the same convertible features in a simple, streamlined form that is easy to clean, easy to use, and easy to live with. The Graco Blossom is an excellent high chair seating system, with 6 child-seating options in one simple high chair. It’s easy to clean and robust enough to last through years of wear, even with more than one child. Graco is a name with a great reputation in baby products, and the Blossom 6-in-1 Convertible High Chair continues the Graco tradition. The Graco DuoDiner LX Baby high chair is a 3-in-1 convertible, with a reclining infant high chair, an adjustable baby feeding chair, and a portable booster seat for toddlers. It is durable, easy to clean, and versatile, for a single high chair that can grow along with your child and their changing needs. In the first stage, as an infant high chair, the Graco DuoDiner LX has three reclining positions and an infant body support. In the second stage, the body support can be removed and the chair adjusted for upright sitting and eating in a high chair with a tray, with adjustable feet and leg rests. In the third stage, the booster seat is portable and comfortable and enables children to comfortably eat at the table with the family. At any stage, the seating pad is machine washable and the tray insert is dishwasher safe. It has a comfortable harness, folds out of the way for storage, and has 2 front wheels for portability. The Graco DuoDiner LX Baby High Chair, Metropolis, is a handsome 3-in-1 convertible high chair with lots of features to keep babies and parents clean and comfortable for years. The rugged, durable construction, easy cleaning, and variety of adjustment settings make this an excellent choice for a long-term investment in your child’s comfort and care over time. The Graco DuoDiner LX Baby High Chair is an excellent 3-in-1, from the trusted Graco brand. One of the great things about the Graco DuoDiner is that, with the recline positions and infant padding insert, it can be used with babies and very small children, and see them through their toddler years. If your child is a bit older, and you want a 3-in-1 high chair that will last them through their next several years of development, a good alternate choice is the Chicco Stack 3-in-1. While not small enough for babies, the Chicco Stack will convert from a high chair, to a booster chair, to a child’s chair, keeping a child at a comfortable table height and eating in safety for years to come. The Chicco has convenient tray storage and is also easy to clean, and it’s a good option for people with slightly bigger children than the Graco DuoDiner LX, who don’t need the features for the smallest infants. The Graco DuoDiner LX Baby high chair is an excellent choice for a reliable, durable high chair that will last and grow with your child for years. It’s easy to clean, easy to move, easy to store, and easy to convert from position to position as your child’s needs change over time. The JOOVY Foodoo high chair is a single high chair versatile enough to accommodate a baby from infancy until they are four years old, or weigh 50 pounds. It’s safe, sturdy, easy to clean, and versatile enough to last for years. The JOOVY Foodoo high chair has 8 adjustable height positions, 5 recline positions, and 2 footrest positions, so it can grow along with your child as their body and their needs change over time. It has an adjustable 5-point harness. The adjustable tray has two positions and a dishwasher-safe insert, and can be removed with just one hand. The high chair can also be folded with just one hand, and wheeled away for minimal, compact storage when it isn’t in use. The leatherette seat pad is soft and comfortable, and easy to clean. It’s got a rugged, streamlined design for easy cleanup and storage, and doesn’t take up a lot of space in the kitchen. The JOOVY Foodoo high chair has a great, modern, streamlined look and a rugged, durable design. It’s easy to clean, folds compactly out of the way for easy storage, and is designed to keep your child safe and comfortable for years to come. Despite all the Foodoo’s adjustable features and settings, it may not be adjustable enough for every child. Sometimes the footrests don’t go high enough, or the seat height adjustment has to be reset every time you use the chair, or the tray is too far from the baby, too high for the baby, etc. Of course, no one single high chair is going to be perfect for every child at every size, but for a comparable high chair with the convertible features of the JOOVY Foodoo, and a few more comfort and adjustability options, you might consider the Graco DuoDiner. Like the Foodoo, the DuoDiner is designed to hold children from infancy up to 60 pounds in weight, folds out of the way, and has two front wheels. But the DuoDiner has the infant seat liner and adjustable positions that seem to fit most children better, and prevent more messes. Insofar as a high chair can prevent messes, anyway. The DuoDiner may be a better choice for children that are unusually active, or are bigger or smaller than average. the JOOVY Foodoo high chair is a great choice for a durable high chair that is easy to clean and designed to grow with your child over time. It’s got great adjustable features and a modern, sleek design that looks great in any kitchen. It’s possibly the only high chair your child will ever need. Chances are, you’ve never seen a high chair quite like the HeartWood Adjustable Wooden High Chair. The ingenious design is not only striking in appearance, but it provides comfort and ergonomic support for children from the ages of 2 to 15 years. It’s the high chair that can truly grow with your child. The HeartWood Adjustable Wooden high chair is designed for children as young as two years old, with depth- and height-adjustable plates for seating and footrests. This innovative design omits the high chair tray, allowing your child to sit safely and comfortably at the family table, bringing them even closer to traditions and connection with their loved ones. This chair eliminates the need to transition from a highchair to a booster seat or other in-between seating. It’s the only chair a child will ever need, from the time they are a toddler, with fully 14 areas of adjustment. Without requiring padded seats for comfort, trays for holding food, or a harness to keep them in place, the HeartWood Adjustable Wooden high chair is incredibly easy to clean and keep looking like new. And the striking design appeals to adults as well as kids, meaning it will never be in the way in the kitchen. This extraordinary chair helps children smoothly transition into adulthood by bringing them to the table comfortably and safely from a young age. It’s real furniture, made of solid wood, so it’s easy to clean and easy to live with. And it’s comfortable and useful even for adults. If you love the idea of the HeartWood Adjustable Wooden high chair, but want an alternative that is more friendly for infants, you might consider the Scandinavian Stokke Tripp Trapp chair. The Tripp Trapp has a similar design principle and has similar advantages, although the method of adjustment is slightly different. However, the Stokke Tripp Trapp also has an optional baby set and tray, available for additional purchase. With those accessories, the Stokke Tripp Trapp can be used with much smaller children and transition them into toddlerhood. However, it’s worth noting that the Tripp Trapp itself is more expensive than the HeartWood Adjustable Wooden high chair, and the matching baby accessories are not inexpensive either, so all together it adds up to quite an investment. Europeans often have their children eating at the table earlier in life, making them more firmly a part of family meals and family traditions. This innovative high chair makes that easy and safe, with a rugged, easy-to-clean design that can be part of your kitchen for decades to come, as it is robust enough to hold adults. The HeartWood Adjustable Wooden high chair is a great way to help your children grow physically as well as socially. The amazing Abiie Beyond Wooden High Chair With Tray is a classic wooden high chair that converts and adjusts from infancy all the way to adulthood, when it becomes an ordinary wooden kitchen chair. This high chair is so well-designed and durable that it won the National Parenting Publication Awards in 2015. It can be quickly transformed into any high position and fit any size person, from babies to adults, without any tools or complicated settings. It has a dual-restraint 3- or 5-point harness, and stain-resistant, easy-to-clean cushions. The chair itself has gone through a state-of-the-art high pressure sterilization system to be resistant to microbes and even safer for children. It is rugged and sturdy, and doubles as additional seating for friends or guests when you need it. The Abiie Beyond Wooden High Chair With Tray is an amazing, safe, durable way to keep your child safe and healthy for all their eating seating needs from infancy to adulthood. It’s a revolutionary, award-winning design, and there’s nothing on the market quite like it. If you are looking for another innovative chair that can transition from infancy all the way to adulthood, another groundbreaking design is the Stokke Tripp Trapp high chair. With the addition of the optional baby seat, tray, and accessories, it’s a completely different take on a high chair that can be adjusted and changed over time to be an adult chair. The Stokke is an innovative Scandinavian design. However, the Stokke Tripp Trapp high chair, along with the baby set and the attachable tray, can all add up to be pretty expensive. The Abiie Beyond Wooden high chair is just as revolutionary, but a more affordable option. The Abiie Beyond Wooden High Chair is a great solution for all your child’s needs, from infancy through adulthood, and along the way it can also double as an extra kitchen chair for guests or special occasions. It’s a unique way to take care of your child every step along the way without adding mess or clutter to your life. Always be yourself, unless you can be Batman. Then always be Batman. This fun and playful high chair has the style and flair one would expect from the DC Comic hero, but is also an excellent high chair, so you don’t have to compromise function for style. The KidsEmbrace Batman Convertible high chair has six seat heights, five reclining positions, and three footrest adjustments, so it’s suitable for children from 5 to 40 pounds, easily adjusting as their needs change. The 5-point harness makes it safe for even small children. It’s easy to clean, with a one-hand detachable tray that is dishwasher safe, and wipe-clean fabric covers. It folds down to an ultra-compact size, and the large front wheels make it easy to move and store out of the way when it’s not needed. It also has a convenient storage basket on the bottom so you can keep frequently needed items close at hand. The KidsEmbrace Batman Convertible High Chair has a lot of convenient features and capabilities designed to grow with your child. It’s safe, comfortable, and easy to use. Best of all, it’s eye-catching Batman design will appeal to kids of all ages. If you don’t want to be Batman, you might consider the Disney Adjustable high chair. It comes in cute Mickey Mouse fabric patterns, can hold children up to 50 pounds, has a 3-position recline adjustment and 5 height adjustments, and folds up extra flat and compact to stay out of the way. The Disney Adjustable high chair isn’t as rugged as the KidsEmbrace Batman Convertible high chair, but it’s a cute chair that is well-suited for the occasional visit of a grandchild or other non-daily high chair needs. The KidsEmbrace Batman Convertible high chair has a lot of great features in a small space, just as you would expect from Batman and his famous utility belt. And, if you are so inclined, it comes in an equally attractive Batgirl design. It’s a robust high chair that will last through your child’s most vulnerable years, keeping them safe and adjusting to their needs over time. OXO is a reliable brand, trusted for making durable, high-quality, well-designed products. This convertible high chair adjusts quickly and easily, without tools, from 5 levels of height and 3 levels of recline. The OXO Tot Seedling High Chair is suitable for children from 4 months to 3 years of age, so it will last through several years of your child’s growth. The comfortable seat cushion is stain resistant, wipeable, and machine washable for easy cleaning. The tray is not only lightweight and easy to remove with one hand, but it sits flat when you set it down, avoiding spills and messes as you get your child in and out of the chair. The big locking wheels make it easy to move or store the high chair, without scratching delicate flooring. The tray can be attached to the back of the chair legs for compact storage, or ease of use as your child ages and moves to the table. 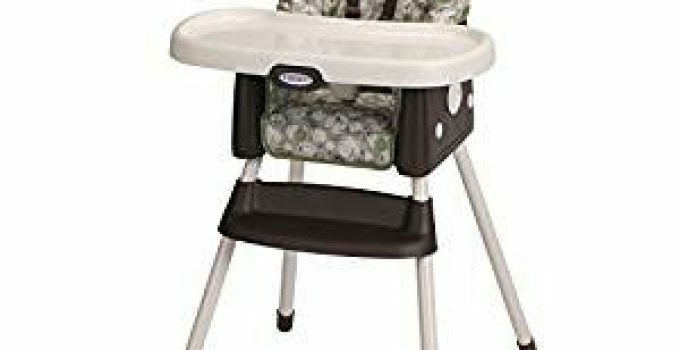 The OXO Tot Seedling High Chair is durable and versatile, with easy and convenient adjustments and thoughtful features like locking wheels and a lay-flat tray. The tray cover, seat cushions, and seat itself are easy to clean, and it’s a rugged design that takes a child all the way to table seating. The OXO Tot Seedling is a great high chair with a lot of thoughtful, well-designed features. If you need a high chair that is a little bit faster to fold and stow away, rather than disassembling the OXO, a good alternative is the Graco Contempo Slim Folding highchair. Like the OXO, the Graco Contempo has 6 height positions and three recline settings, and is good for children up to 3 years. It also has the one-hand removable tray, although it doesn’t have the lay-flat feature. It’s also easy to clean, and has four locking wheels. However, the Contempo quickly and easily folds into an incredibly slim profile. The OXO Tot Seedling is a versatile, durable high chair with everything you need from 4 months to 3 years of a child’s life. The innovative Scandinavian design of the Stokke Tripp Trapp high chair is designed to have small children sitting at the table with the family as early as possible, and then to adapt and adjust with them all the way through to adulthood. It’s designed for children over 3 years old, up to adults weighing 300 lbs., and quickly adjusts so they are always comfortable and ergonomically correct from their earliest years. It is made of cultivated beechwood, and the streamlined design leaves you with few surfaces to clean or nooks and crannies where messes can accumulate. It’s designed for a lifetime of use. It comes with a 5-point safety harness and an extended glider to prevent tipping and protect floors. The European practice of having children at the family table is an excellent one, and the innovative Stokke Tripp Trapp high chair is an excellent way to achieve that goal. However, adapting the chair for children younger than toddlers quickly becomes an expensive proposition. Many people who adore the Stokke Tripp Trapp also find that it’s simpler to use a different high chair for the first couple years, and switch to the Tripp Trapp a little later, when their child is ready to sit at the table. For a similar high chair to the Stokke Tripp Trapp, but slightly less expensive, consider the HeartWood Adjustable Wooden High Chair. While the ergonomics of the HeartWood are slightly different, the function and principles are the same, and it’s a great idea to have a single chair that you can use well after your child has grown. The Stokke Tripp Trapp is an exceptional design, and builds lifelong good ergonomic and eating habits from a young age. It’s a bit frustrating that there are so many accessories necessary for smaller children, and that the accessories are so expensive, and it seems like it would be smarter to get an infant high chair, rather than purchase a number of expensive short-term add-ons. The versatile Peg Perego Siesta high chair is more than a high chair. Not only does it adjust to nine different height positions and five recline positions over time, but if you remove the tray and recline the chair, it makes a perfect spot for a baby to nap. The smooth caster wheels even allow you to move the high chair from place to place without disturbing a baby. The wheels also automatically lock for additional safety. The Peg Perego Siesta high chair can see a baby from birth to 3 years, nap time to meal time, eating from the tray or dining at the table. And it folds to an extremely compact size that is freestanding and won’t tip over. It even has a net pocket for convenient storage. The Peg Perego Siesta is an incredibly versatile high chair for your child’s first few years, keeping them safe and comfortable in any position. Some may find that the Peg Perego Siesta High Chair is a bit expensive, and want a similar high chair, with the ability to recline infants all the way into the nap position, but with a slightly lower price tag. If that’s the case, it may be worth considering the Oribel Cocoon 3-Stage High Chair. Like the Peg Perego Siesta, the Oribel Cocoon will recline all the way to the napping position, is an ergonomic design that is easy to clean, and folds flat for storage. The Cocoon also has the nice feature of the tray snapping onto the rear for easy, out-of-the-way storage. However, the Oribel Cocoon doesn’t have the extra smooth, well-engineered wheels of the Peg Perego, so it wouldn’t be as smooth a way to move a child from place to place within the chair. If that isn’t an important consideration for you, the Oribel Cocoon 3-Stage high chair is less expensive than the Peg Perego Siesta, and has many of the same capabilities. The Peg Perego Siesta high chair is a great option for smooth operation, great versatility over time, and super compact, free-standing storage. It’s optimally designed to grow with your child from birth through 3 years of age. If you are a first-time parent, it may be confusing to choose a baby high chair for the first time. That is why you need to carefully review the market and survey the features of various chairs. Baby high chairs come in different styles and configurations. That is why you need to make a careful decision along these lines. A baby high chair may be used from the time a child is six months old to when they are three. High chair seating today is made to grow with the baby – beginning with an infant seat to a booster and finally to a chair. If you have limited space, shortlist your high chair choices to portable models or boosters that affix to a dining chair. The chair should be easy to clean and maintain. After all, a baby can make a mess of a high chair, so it needs to be resilient. Although you do not need to buy a high chair following your child’s birth, you still should be reviewing high chair seating in the interim. This type of furnishing is a long term investment – a furnishing that will be needed for about three years. When buying a high chair, it needs to support your baby well and also be convenient for you. Also, you need to review the safety features as well as how and where you will be using the chair. The following chairs are presented to give you an idea of the different types and styles available. This is a classic high chair that is trending once again. Its clean lines and understated appearance make it a popular choice for most home decors. Some of the chairs that are featured do not offer a lot of frills, while others feature amenities such as a reclining seat, adjustable height, and simple foldability. This lightweight yet sturdy chair usually makes clean-up a breeze and is typically featured with wheels. The chair also folds easily for convenient storage. This is a chair that is ideal for anyone with budget restrictions. If you want a chair that offers all the amenities, you will want to review the high chairs that feature multi-functional seating and can also be used as a cradle or swing. This chair displays amenities such as an adjustable seat that reclines, casters for easy transport, and a stashable table. This is a legless chair that can be affixed securely onto a table for sturdy and safe seating. This chair does not take up too much space. All you need to do is strap this feeding chair onto one of your current dining chairs. The chairs usually feature lap trays that are removable too. That way, your child can use the table when he or she is older. For reasons of safety, the most basic and important feature to seek is a five-point restraint seat belt or t-strap. A lap tray alone is not enough to secure a baby in a chair. The chair should also feature a crotch restraint or crotch post to prevent the baby from sliding out of the seat. Make sure the chair is rugged enough to withstand daily use and, again, is easy to clean or maintain. Choose a chair that does not display crevices or grooves that can easily catch spills. The type of chair you choose will depend on your décor and budget. You need to think about how you will be using the chair and some salient details about the product. You can shortlist your choices and make an easier decision by considering the following questions. What does the chair feature? Is the seat of the chair adjustable? Can the lap tray be removed and is it dishwasher safe? Look for a sturdy chair that simplifies clean-up. Are the tray and seat cover simple to remove and clean? Your baby is capable of making messes that cannot be easily cleaned. That is why you need to make sure the feeding tray on the high chair can easily be removed and is dishwasher safe. If the chair’s seat cover is not simple to clean or throw in the washing machine, do not consider the chair. What are the height and weight restrictions? If you want to get the most value for your money, seek a chair that can be converted for an infant to toddler to older child. Does the chair fold and store without difficulty? If you choose a more traditional chair, you may find that it is difficult to fold or store. This means the chair may take up too much space in your kitchen or dining area. If you have limited space, make sure you choose a foldable and storable chair. If your baby feels uncomfortable in the chair, he or she will not be a happy baby at mealtime. Make sure the chair features a well-designed and padded seat that can easily be machine-washed. Make sure the seating is as comfortable for baby as it is for you to wash and clean. Can the chair fit nicely into the living space? Like any other type of baby furnishing—such as a swing or crib—you need to make sure the chair will not overwhelm your living space. If your space is limited or you need to move the chair from one room to the next, you need to take some measurements. A smaller and more streamlined chair may be needed if you have space restrictions in your home. For example, you may want to consider a booster feeding chair or a portable durable chair. How long will the chair be used? Most babies can sit comfortably using a traditional high chair until they reach the age of two. At that point, you will usually need to switch to a booster seat used with a regular chair. Other high chairs can last longer, as the tray can be removed so the chair becomes a big kid’s chair. If you want to use the chair for more than one child, buy a chair that can be converted so that it can be used for an older child. Should the chair be portable? If you are a mobile person, you need to seek a chair that offers portability. You can even find portable feeding seats that can easily and safely be locked onto tables. Most of these seats are lightweight and therefore easy to carry. You can stash them away in your baby bag or even in the basket of your baby’s stroller. Naturally, you need to find a chair that is considered safe. That means the chair should be safety certified. Make sure the chair is endorsed by the Juvenile Products Manufacturers Association (JPMA), which only certifies products that have gone through rigorous safety tests. You will also want to make sure the chair is durable. In other words, as your child gets older, the chair should not be easy to tip. The legs should also be sturdy and not set too wide apart. If the legs tend to splay, they can turn into a tripping hazards. In addition, the chairs you short-list should be made of BPA-free materials. Also, if you choose a wooden chair, it should display a smooth finish. Make sure its edges are smooth too. The chair should have at least a t-style type strap that secures the baby for a snug and safe fit. Because babies tend to want to explore, even when seated, this type of strap is important to a child’s well-being. Again, you cannot rely on the lap tray alone to keep your baby secure. When choosing a high chair with casters or wheels, make sure they are designed to lock. That way, you can prevent the baby from maneuvering the chair without you. In fact, make sure you never leave your baby unattended in a chair. Always be next to your baby to prevent any problems such as toppling, which can happen when a baby is unsupervised. If you do select a portable chair, make sure that the table to which it is attached can support the chair’s weight. Again, you need to buckle the baby into the chair to ensure his or her safety. That wraps it up for this detailed guide on choosing and buying the best high chairs 2019. If you are currently seeking a baby high chair, talk to other parents who have bought high chairs and used them. Seek chairs that offer versatility as well. For example, a four-in-one chair makes it easy to recline an infant for bottle-feeding purposes or sit a child upright when he or she takes solid foods. Being able to adjust the height of the chair can help too. If you can find a chair with a seat that can be removed and used in a regular chair, you have found a true winner when it comes to versatility and use.